Every kitchen remodel starts somewhere – with an idea, a theme, a style, a desire, a plan, a need, a whim that involves the yearning for something new. 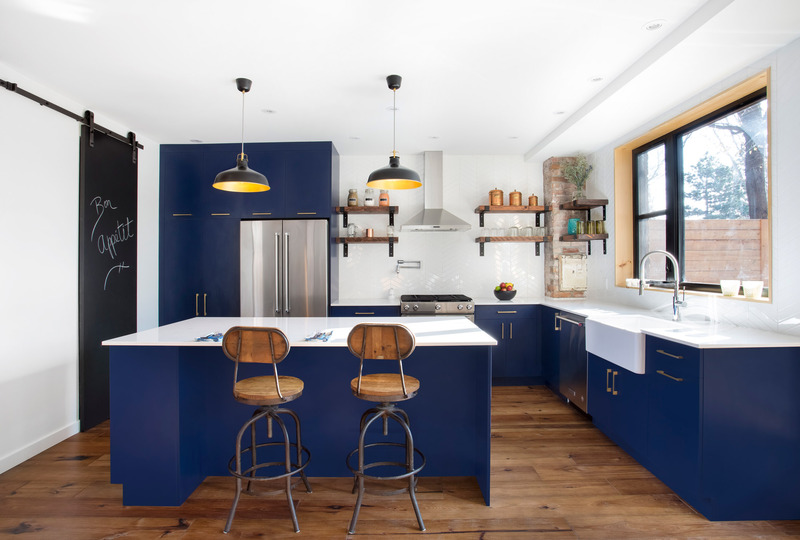 But this kitchen, one could say, just came out of the blue. Blue, in fact, was the one thing the owners of this older home in Montreal’s St. Henri district knew they wanted for sure. Blue cabinets, to be precise. 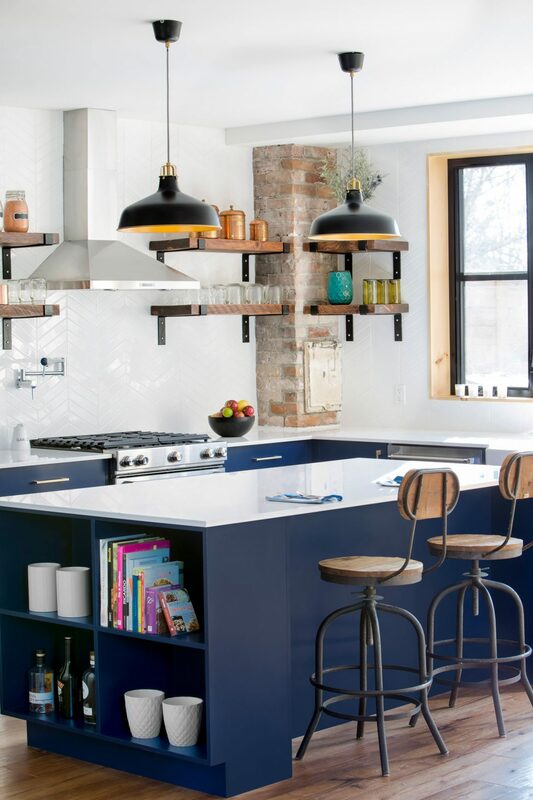 Navy blue cabinets, stainless-steel appliances and crisp white quartz countertops combine to provide the modern elements of this kitchen, while the thick wooden shelves with their cast-iron brackets, the vintage-style stools and farm-style sink contribute a few rustic undertones. 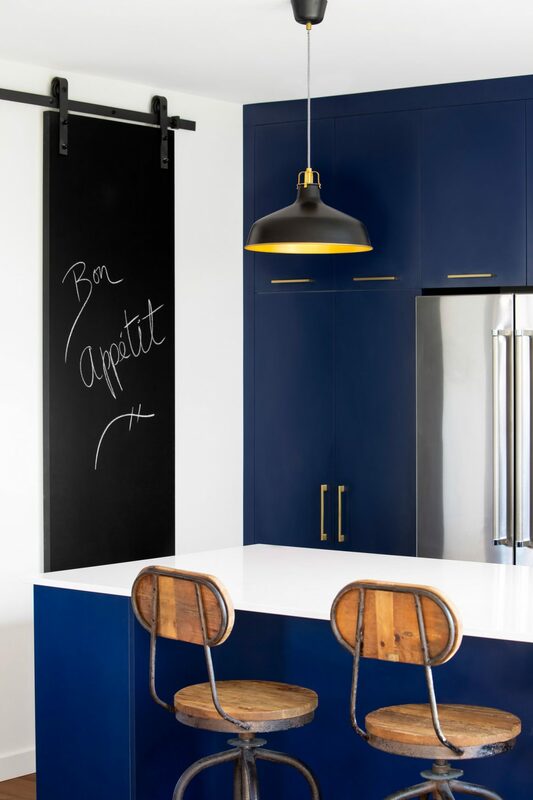 The couple opted for a rich navy for their melamine cabinets with gold-toned metal hardware, and topped with a crisp white quartz counter surface. Brodeur says the fact that the island countertop was designed as a single uninterrupted space – without a sink or range – created a large work surface, as well as a versatile spot that serves as an inviting hub for friends and family to gather around when the homeowners are hosting. A built-in shelving unit is incorporated at one end of the island, providing space for cookbooks and other items to be displayed. The sun streams in through windows that overlook the backyard. The owners also knew what they were looking for in terms of style. They wanted what they referred to as something modern, yet rustic, Brodeur says. 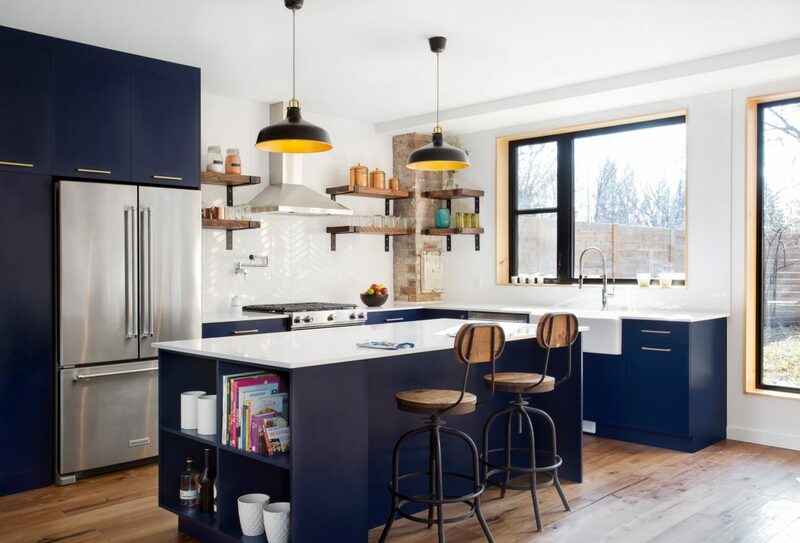 The deep blue of the cabinets contrasting with the white of the countertops took care of the modern part of the equation. The rustic element would be introduced with a few select accents. 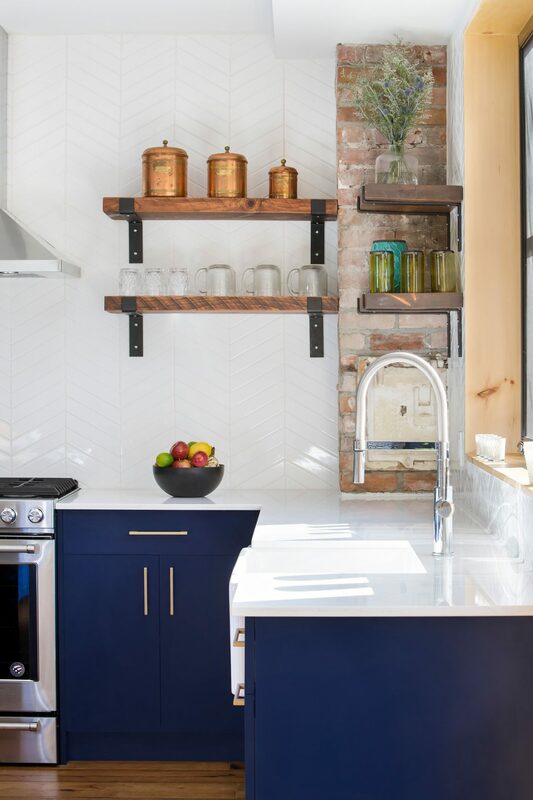 A pot-filler faucet is mounted to the wall, which is covered in white subway tiles set in a chevron pattern. Designer Mélanie Brodeur took the backsplash up to the ceiling. The first rustic touch was injected with the thick natural wood shelves on the walls. 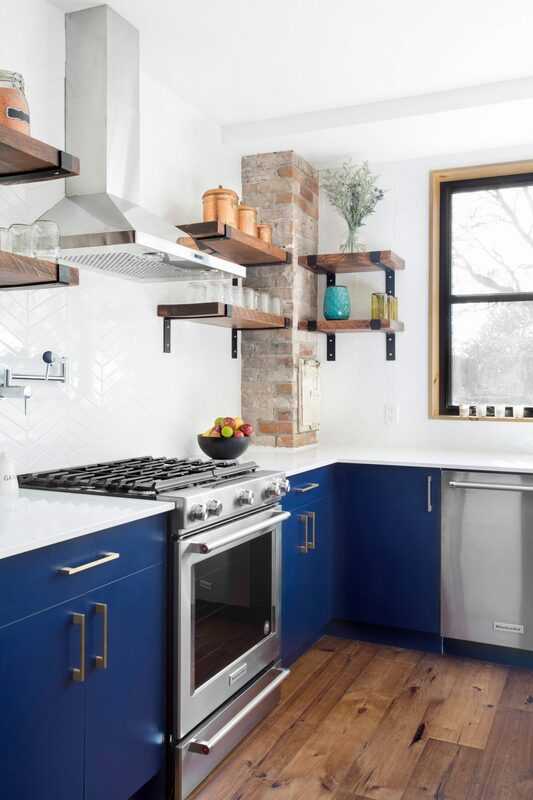 Mounted with black cast-iron brackets, the upper shelves on each side of the range hood, as well as tucked up against the original brick chimney in the corner of the room, filled the bill. These sturdy accents also provide function, creating a venue for the display of such rustic-themed elements as copper canisters and vintage glass jars. The barn-style pantry door, which glides along a black metal upper track, also plays to the rustic theme. Its black painted chalkboard finish forms a large surface that can be used as a life-size note board or artistic canvas; a playful element that is bold, dark and eye-catching. A barn-door-style panel that runs along a steel track provides access to a large pantry. With a black chalkboard-painted finish, it forms a large surface that can be used as a life-size note board or artistic canvas. The black metal dome pendant lights above the island add a slightly industrial vibe to the space. The counter stools, with their wooden seats and backs, and steel frames, add a classic vintage look. And the black metal pendant lights over the island bestow a slightly industrial vibe. 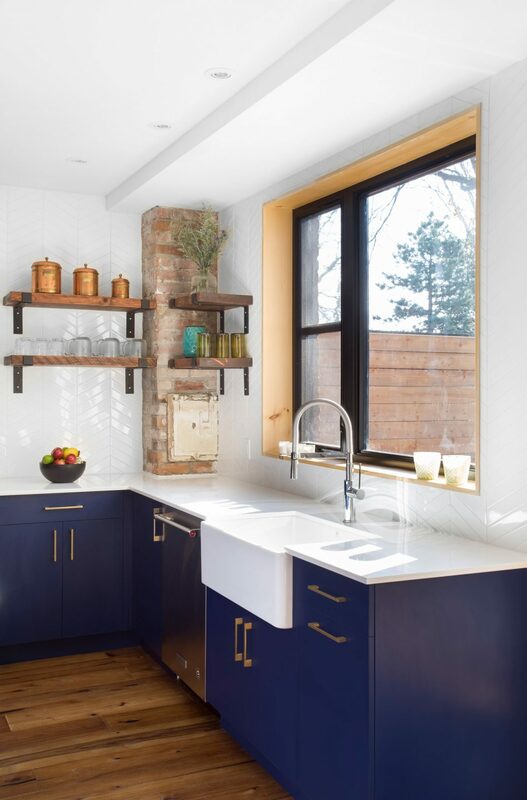 The farm-style sink, as well as the white porcelain subway tiles set in a chevron pattern on the walls soften the overall look. And a convenient added touch that is both modern and rustic: a wall-mounted stainless-steel pot-filler with an articulated arm by the range top.